CLEVELAND– Just when you think he can’t possibly have anything left in the tank, LeBron James pulls off an all-time playoff performance. The Cavaliers topped the Boston Celtics in Game 6 of the Eastern Conference Finals, 109-99, to force a Game 7 in Boston on Sunday night, behind James 46 points. Without further adieu, let’s dive in to three takeaways. It may sound hyperbolic, but any word you could possibly think of to describe James’ Game 6 performance simply feels inadequate. James put up 46 points, 11 rebounds and nine assists in 46 minutes, resting only the final 57 seconds of the third quarter and final 57 seconds of the game with the Cavs up 12. 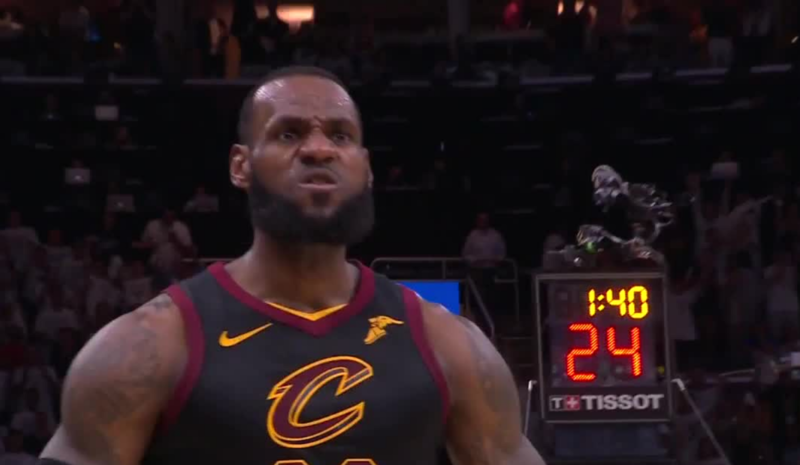 He scored the final eight points for Cleveland on two 3-pointers and a layup, and put up 12 points after he appeared to injure his leg as Larry Nance Jr. fell into him in the second half of the fourth quarter. One of the most important stretches for James was during the second quarter. The Cavs trailed by five heading into the frame, but outscored Boston 34-18 behind 17 points from James, giving them an 11-point lead at halftime. As big as James was, he’s going to need to pull out all the stops for one last game in this series. But despite his own personal Finals streak and the Cavaliers season being at stake, James says he trusts the work he’s put in more than anything. Love did not return and continues to be evaluated. Per Jason Lloyd of The Athletic, Love said his status for Sunday’s game is a “toss-up.” Considering the Cavs’ struggles finding a third option on offense at times in this series, their chances without him looked bleak. Thankfully, Cleveland had plenty of guys step up in his absence. James’ heroics combined with the contributions of those four guys assured the Cavs a victory even in Love’s absence. Hill’s 20 points on Friday night were a high for him in the playoffs this season. He came out with an aggressive mindset early on and looked to attack, giving the Cavs plenty of movement offensively. Another key for Hill? His pregame meal. Hill said all three games at home this series, his go-to has been barbacoa tacos with guacamole from Chipotle. “I’m for sure going to find a Chipotle in Boston, I’ll tell you that,” he joked postgame.